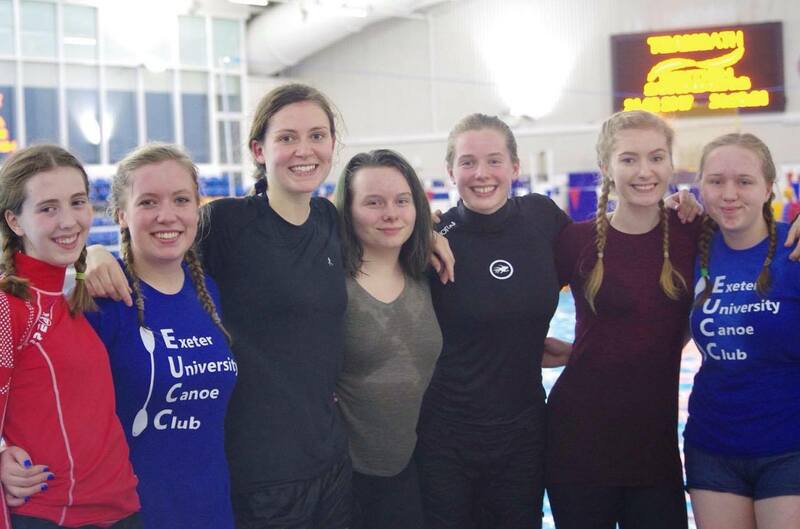 On Tuesday the club headed off for another installment of “Exeter takes on South West Uni’s” Polo edition. After much faffing to get petrol money, despite being reminded by Ben about half an hour before (cough cough Alex and Matt) we finally hit the road in the bus and Adam’s car. Despite getting lost as we careered round Bath Uni, almost mowing down a group of runners in the process, us and the bus made it to the car park in 1 piece, and in high spirits. A short walk and quick change into polo gear led us to ogle in wonder at the pool, 50 beautiful metres of clean, warm water, as well as 18 carbon boats, surplus polo paddles, BA’s, helmets, and decks (needless to say, we were very jealous). 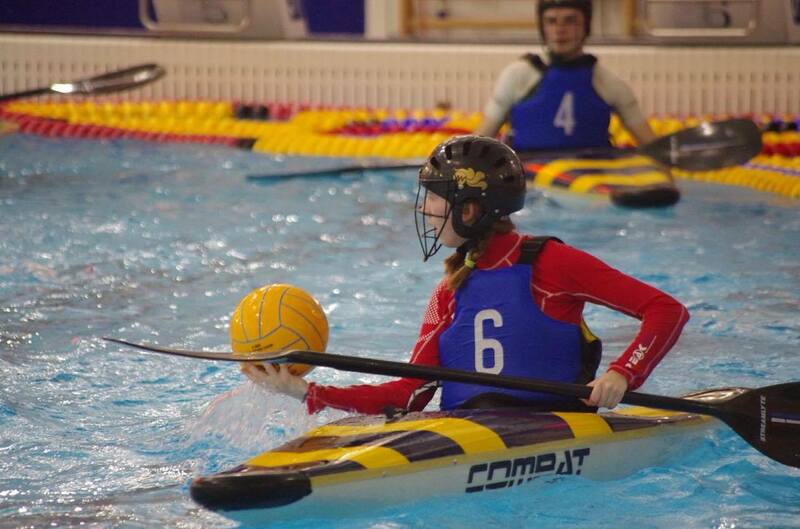 The tournament kicked off with an Exeter A team vs Bath match. 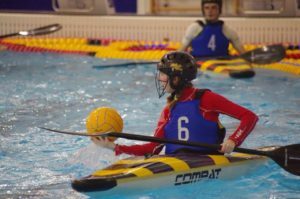 After this it was the turn of the B team, and the debut of our very own Exeter University Ladies Canoe Polo Team + Tristan (what a mouthful!). Nervous but excited (this was the first competition for most), the game commenced after a quick change over of boats and some encouraging motivational pep talks from the A team. Sadly we suffered defeat to Bath (an all male team,) failing to score. After this it was the turn of the A team again. Play had definitely picked up by now, featuring goals from Adam and co making for a nail-bitingly close match (7-4, 4-4 at half time). After a no-binning pact with Bristol University it was the Ladies team again. Playing yet another all-male team, our play dramatically improved in this game, leading us to almost score during the 1st half! This game was also an excellent opportunity to get some shots of the team in action, in addition to the usual post-match team photos. We left the pool tired but in very high spirits (partially due to the Kayak themed cake made by Daisy and myself earlier that day, #blowingmyowntrumpet) and started the long journey back, excellently driven by Ella on her first time driving the bus with passengers. A quick stop at McDonalds at the insistence of Sam, and we continued back home to Exeter. Whilst we did not win any matches, overall we had an amazing time competing and getting the chance to bond as a team, proving that EUCC is definitely “probably the best canoe club in the world”. Bring on BUCS!! 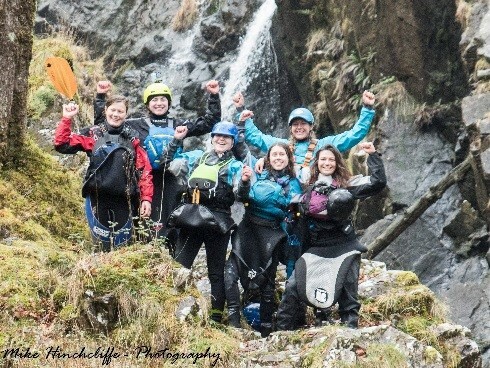 Heading up to North Wales, a group of ladies from Bristol, Bath and Exeter university joined coach Lowri (from FlowFree) for a weekend of river reading, leadership skills, safety & rescue tactics and confidence building. We spent Saturday on the Dee, where the group practiced their decision making skills as well as performing real rescues and doing some awesome boofs on Town Falls. On Sunday it was time to try something completely different, and we headed to the slightly wet rocks of the Gamlan to practice group management on steeper ground while also having fun whizzing down what was some people’s first waterfall! It was an absolute blast and we saw a huge step in confidence, skills and knowledge. I will put it to good use, when the rain finally comes! Canoe polo is a game played with a team of 5 and 2 subs, normally with banks of cheering teammates on the side, we decided to buck the trend and play ALL our games with JUST 3 people. 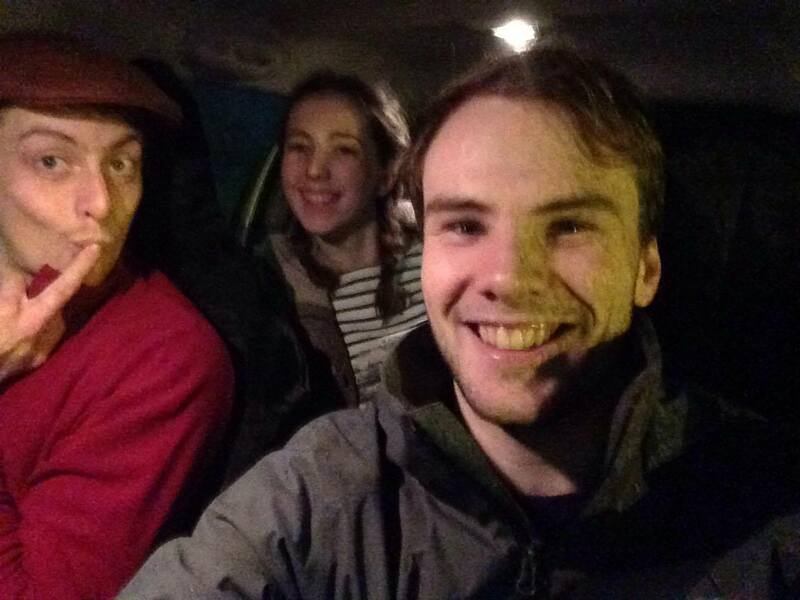 The brave trio of myself, Adam Finley and Lowri Peters set off with plenty of time to spare for stops at the *apparently blessed* Gordano Services described as ‘just a very nice services’ by Marco Polo (ey polo pun #1) on his 13th century epic to China. Upon arriving we threw caution to the wind and made the ballsy decision to attack all the teams full on with our plucky team of 3 (imagine a rowing boat taking on an armada of 15th century galleons, although the galleons are carbon polo boats and instead of wind they are powered by Streamlyte carbon paddles). And if I’m honest it was by far the best decision we made! Playing with a team of 3 doesn’t half tire you out but it was brilliant training for endurance, tactics (OVERLOAD RIGHT) and general polo stuff. We were very pleased with the results (5:1, 5:1, 6:0, 3:2 – Bristol, we almost had you…) although we may have lost every single one…. Basically we were the underdog of all underdogs, although this did give us an added novelty and much support from all teams attending! This novelty truly came into its own when I swam (cry) and there had to be a timeout due to not having enough players (an event which none of the refs had ever experienced before and may never again!). All in all brilliant set of games! HYPE HYPE HYPE for BUCS! PS. I was a binning machine with 4 bins to my name, and I must say…. Binning is most definitely winning! …Turns out we didn’t sacrifice enough freshers. With the lack of rain in the south-west, Flozza consulted the Captain of timings about what us desperate mortals could do in this hour of need. He remembered a river from a previous life and suggested it. This was on a low at the time of suggestion, the highest river levels around, so Flozza thought he might have telepathic links to the river gods of Exmoor, and trusted the advice. 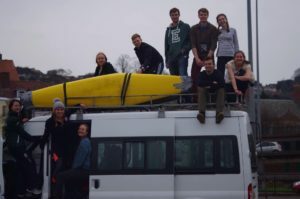 After hearing the moaning from “experienced paddlers” about how there was no water, and deciding where to get on and paddle, we efficiently left James’s car, without boats, at Exebridge, ready for the shuttle, and put on at the slide in Dulverton. Team drivers went first as the plan was to sort the shuttle before the rest of the club arrived (or at least this was the plan). A group of canoers doing their 4* training were just ahead and slowed down progress for some time. 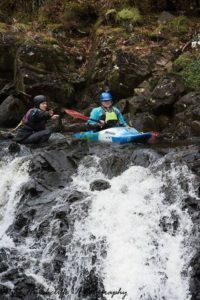 When we overtook them the bumpy rapids of the Barle came to life and the leaders utilised this rare occurrence of decent white water this year to practise some much needed skills. Looming round the corner was a simple low volume weir where a perfect playhole was formed on the other side of the river. This provided the safety, in all manner of boats, with as much fun as their group would let them (David dropping his poggies while surfing and disappearing round the corner to find them, and Matt leading a bunch of fresh off into the unknown) but alas we had to part ways. The river wound down till the get out and everyone agreed it was well worth the time and effort getting there even at low levels. At the get out team drivers tried to make a hasty and efficient shuttle. However, because James was new to shuttling a river trip, he didn’t ask anyone to take his car keys and left them at the top of the river… This classic mistake was rectified by a local offering to drive Swales up to get the bus, and then Daniel and I could get our cars when James got his keys from the bus. With a quick change and loading of bus, we sat down in the pub with a drink and ogled at the carvery sitting only meters away. So this weekend we remembered write ups are a thing, and it’s quite fitting that the last Loop write up was exactly a year ago. 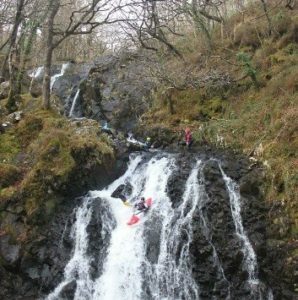 After the previous night hinting that we should go paddling, by flooding Devon’s Crealy Adventure park, we decided it might be a good idea. After over a month of praying to the rain gods, and attempting to sacrifice freshers to appease them, we managed to get decent levels. Captain Brearley had to step up to the mark of Trip sec and organize the weekends endeavours. With a mixture of graduates, a PhD student, a masters student and an undergraduate, an advanced group set off relatively early in search of a rare sighting; The Upper Dart on a medium!!! Never before had such levels been seen in recent history. 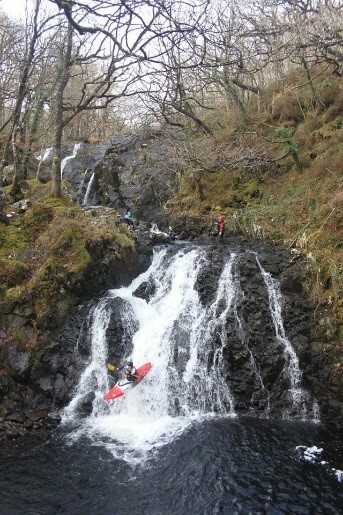 They managed to get down this with minimal difficulty and with a 50/50 split for dry head runs, it could even be called a successful trip. They met the rest of the club at the get in for the loop only 5 minutes after they had arrived in Newbridge car park. After proclaiming Brearley the Captain of timings, they sorted into groups and set off down the river. Despite it being the first decent trip of the year, only Ella Waples represented the fresh to white water kayaking. Thankfully, David Stephenson had invited two others new to the sport so the safety ratios weren’t totally wasted. After Sam Johnson took a cheeky swim, we managed to get down past triple step with little faff or carnage. This was interrupted when there were 3 swims, all around spin drier, that were quite smoothly dealt with. After a gentle paddle from here to the get out we managed to run the shuttle and be back in Exeter before it was too dark. Well done to Ella, who even after seeing the previous night’s rain, still braved the terrors of the loop and smiled the whole way down, even after her only swim 500m before the end. Fingers crossed the rest of the season continues to be so fruitful and the club can make up for lost time with such a delayed season.